We ate at Sassafraz in Union City the other night. A white table cloth restaurant that I’d been hearing about since we moved here. A lovely setting. 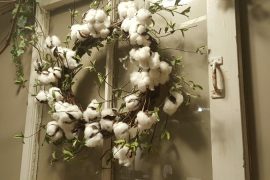 AND as befits the territory, the wall hangings were made with wreaths of cotton bolls.This has been cotton country for a long time. 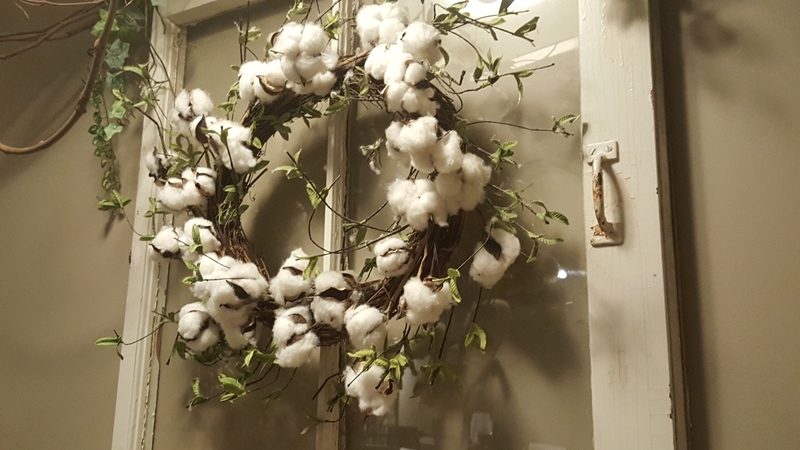 When I first started visiting here oh so many years ago, coming during harvest season, the roads would look like there’d been a dusting of snow in the 70 degree weather – cotton all along the sides of the streets. At Sassafraz, I had to try their fried okra. 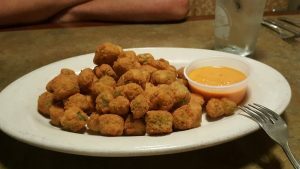 What can you say about fried okra? It wasn’t slimy. As with all fried appetizers, it tasted like a fried…..appetizer. It really didn’t matter what was under that breading. But the little spheres were hot and fresh and crispy. My salad was an iceberg lettuce, julienned carrot mix. Nothing special at all. The hot yeast rolls with strawberry butter were wonderful. The entrees were delicious. 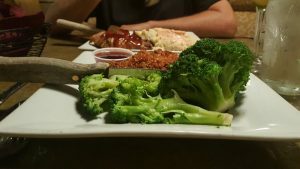 I had the pecan crusted chicken breast and it was perfectly cooked and the crust was delicious. They served it with a raspberry pepper sauce, luckily on the side, more sweet than peppery, not a good match for the chicken. My broccoli, was a perfect crisp tender, steamed bunch. 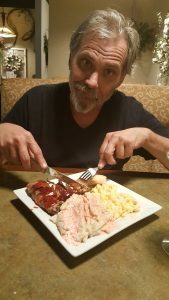 Randy ordered the pork tenderloin wrapped in bacon. It was tender and delicious. The menu said it had a horseradish and creole mustard rub but that flavor was not in evidence, the bourbon peach BBQ sauce while delicious could have been wonderfully offset and balanced by the rub. 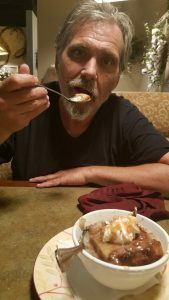 His mashed potatoes were a disaster in my opinion, topped with …..strawberry butter. Need I say more? Wonderful on the fresh yeast rolls, a really bad idea on mashed potatoes. See those pink mashed potatoes! every bit as delicious as I remembered from the night before. Oh, and by the way you can buy that strawberry butter by the pint Mason jar in their bakery. I suggest you try it on their rolls, also available in the bakery. Copyright © 2017 Lara's Favorite Things. All rights reserved.